Writer/director Xavier Dolan has made quite a splash in the world of film. 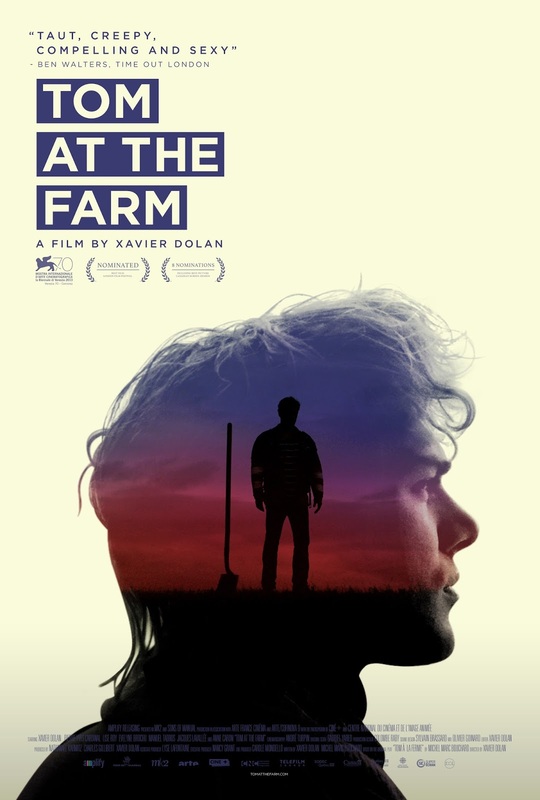 “Tom at the Farm” is Dolan’s fourth film, a film that he wrote, directed, and performed in, and is about a young man who arrives at a quiet farm for the funeral of his boyfriend only to find out that the grieving family was unaware that their son was gay. It’s a bit of a departure for Dolan who typically explores the deeper, more personal aspects of love and relationships. “Tom at the Farm” is a slow burning, subtle suspense thriller about love and infatuation and the control and seduction that attract people to one another. Tom (Xavier Dolan) arrives at a small farmhouse, the childhood residence of his recently deceased boyfriend Guillaume. 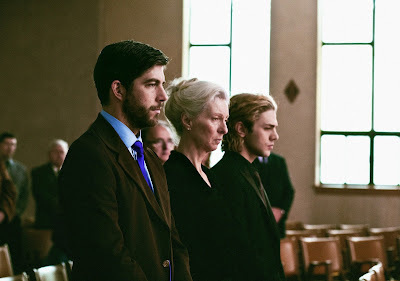 At the funeral Tom encounters Guillaume’s older brother Francis (Pierre-Yves Cardinal), an aggressive and homophobic man who is trying to keep his mother Agathe (Lise Roy) from finding out that Guillaume was gay. Francis forces Tom into lying to Agathe, a desperate attempt to keep a secret that becomes a peculiar point of manipulation and flirtation for Francis and Tom. Dolan displays early in the film that perceived expectations related to the narrative and characters aren’t going to play out like normal. There is a sense of trepidation the moment Tom arrives at the farm, an uneasiness that settles into repeated moments throughout the film. The tone is at one point dramatic and at another anxious, moving at its most random times into realms of self-afflicted comedy but it’s never out of Dolan’s control. In one instance Tom and Francis have a one-sided confrontation in a small bathroom with Francis bullying Tom into the corner. This escalates into a frantic chase through field of crops, a jarring change of pace that is filmed with a hyperactive camera chasing Tom in close-up, ending with Francis physically beating Tom into submission. Later on the two men dance an apprehensive tango that plays unexpectedly flirtatious for both in different ways. It’s these changes in narrative structure and style that make “Tom at the Farm” challenging at times. Francis is abusive repeatedly yet Tom makes excuses for this behavior, even staying with Francis when given the opportunity to leave. It’s erratic and only half the time makes sense. Still, in the capable hands of Dolan it somehow fits and works for the shifting structure. Gabriel Yared builds a romantically influenced score; it’s exceptional and accommodates the changing perspective of the title character throughout the film. There are some fine performances here as well. 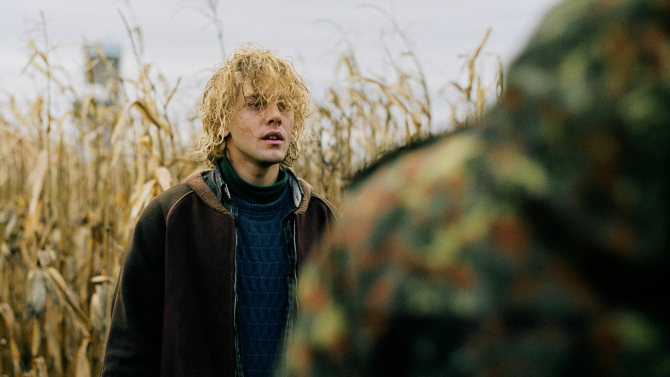 Xavier Dolan builds a mysterious and lost quality with his portrayal of Tom. Pierre-Yves Cardinal is intimidating as Francis, a menace that is felt with every line of dialog. “Tom at the Farm” is never what seems to be, it rarely plays to the middle ground of storytelling but instead explores the boundaries of the themes it employs. Xavier Dolan continues to grow and experiment as a filmmaker and “Tom at the Farm” is the most accomplished of his catalog so far.